Life is determined not by the things we do, but by Jesus. If this passage is about anything, is about anyone, it’s about Jesus! We American Christians have been taught to look for the exceptional, for the extraordinary. Miracles, for us, are expressions of power, of glory. Jesus doing something that no one else has done! Jesus doing something no one else can do! Feeding five thousand with just five loaves and two fish! Walking on the water! Changing water into wine! Each one, every one, showing us, convincing us, proving to us, that Jesus is more than mere human! Jesus is god! In the Large Catechism Luther wrote to pastors, he pointed out the difference. believing-in is what makes something or someone a god. believing-in is looking to someone for all good. believing-in is finding refuge in all need. believing-in is staking our life on someone. It’s depending on someone, relying on someone. “And his disciples believed in him.” Those are important words. Words not to be taken lightly. And that’s what this miracle is about. John contrasts not, simply, the water and the wine. He compares that’s six stone jars and Jesus! The jars for the rites of purification represent the piety, the devotion, the spirituality, the religion, of the day. It the people believed-in they believed in the water, in the washing. Washing hands. Washing food. Washing plates and bowls, cups and utensils. And when all was done and said, they were just as unclean, just as impure, as they were before they washed. Six stone jars standing for the life and the faith of the people apart from Jesus. But Jesus tells the servants to fill those jars with water. Not because he couldn’t make wine without it, but to signal that the rites and traditions – apart from him – were powerless, were unable, to change anything or anyone. When the steward spoke to the bridegroom, he proclaimed gospel, “You have kept the best until now!” That wine – that best wine – was Jesus! Crisp! Clear! Robust! Full-bodied! Water? Well, it was nothing more than water. Plain. Ordinary. Everyday. This is the first of the miracles on which John builds his gospel. Signs he calls them. They aren’t shows of power. But things that have meaning, importance. And this one reveals the abundance, the generosity, the love, Christ brings. 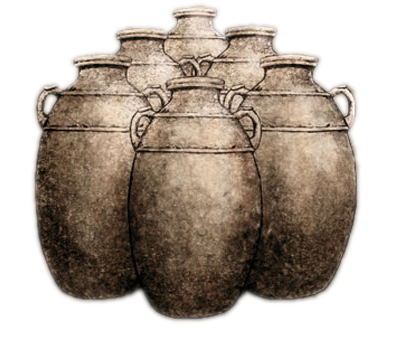 The six stone jars no longer have the significance to us that they did for the people of Cana. Today, our “faith” is anchored in other things. Prayer. The bible. Tithing. We even believe in our own believing. Have faith in our own faith. These are our “rites of purification.” And they, too, are nothing more than stone jars. Nothing more than water. We, too, believe “that,” not “in.” But for both of us, for the people in Cana and for ourselves, the best wine, the wine unequaled, unexcelled, isn’t what we do. It’s Jesus. It’s Jesus. But then, that’s what all of this is about… Jesus! We read the bible, both old and new, and we see Jesus! We listen to the sermon, and when it’s done right, we see Jesus! We see Jesus in a palmful of water! We see Jesus in a pinch of bread, in a sip of wine! We see Jesus in the faces that surround around us! Our songs, our words, even our silences, are full of the glory of Christ! We see Jesus and our world is full, is overflowing, with faith and hope and love! Especially, with the love! We don’t believe-that there is a Jesus, Like we believe-that there’s a santa claus or an easter bunny or a tooth fairy. We believe-in Jesus because it’s Jesus that changes our watered-down religion into wine! It’s Jesus who changes our weak, feeble, ineffective convictions into a brave, new world unlike anything we could imagine. Those six stone jars – those six hard, cold jars – change nothing, change no one. But Jesus! Christ! He has changed the world forever! We believe! We believe-in! Believe-in the things, in things that matter! We believe-in God the Father almighty! We believe-in the Holy Spirit, the community, the church! We believe-in forgiveness, resurrection, life! But most of all, we believe-in Jesus! We believe-in Christ! “I came,” says Jesus, “not that they may have wine. I came that they may have life, and have life abundantly! Life pressed down! Life shaken together! Life overflowing! Life always! Life forever!